This coming Saturday May 9, illest Los Angeles once again transforms into an art space for the opening reception of Impressions: A Collection by Kenneth “KSOLE” Soleta. I wasn’t planning on curating an art show so quickly after BRANDALISM; I wanted to take a little break and nurture my role. But this one fell on my lap organically and it made a lot of sense. illest/Fatlace have a very specific culture to them. We have origins in bboying, design, graffiti and hiphop. But yet there’s been an evolution into the automotive industry and a presence in cities across the world like Los Angeles, Honolulu, Hong Kong (!!! ), and Manila. As I work as a curator, I have to keep all of that in mind. So when Ken approached me with a collection from the Philippines, I said yes. 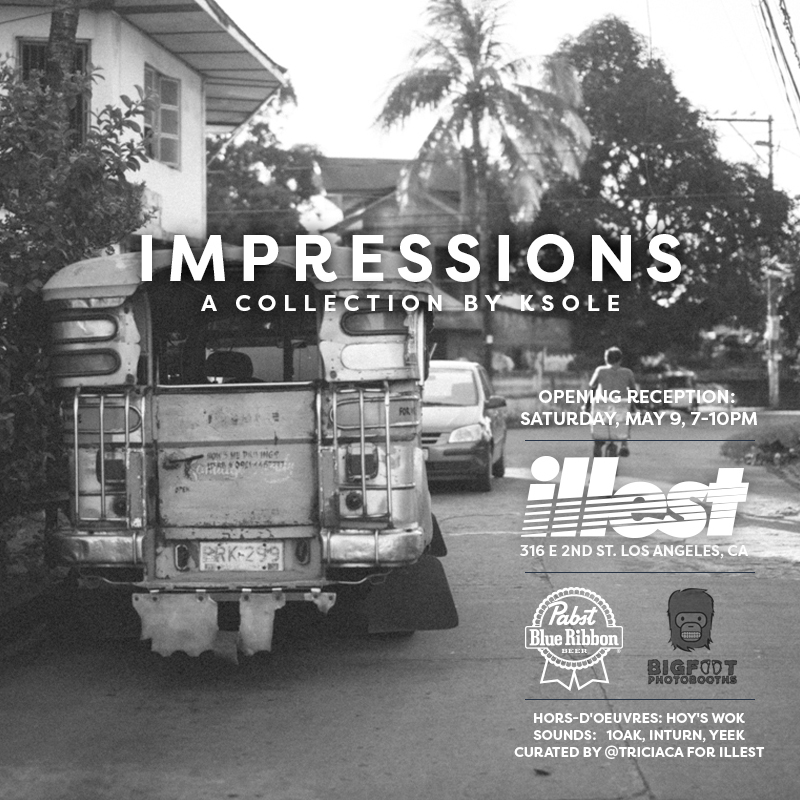 Los Angeles, CA – IMPRESSIONS: A Collection by KSOLE opens Saturday, May 9th at the illest boutique in Downtown Los Angeles. Through the use of unedited film prints, the exhibit surveys the Philippines as a first time visitor. By definition, an impression is the first and immediate effect of an experience upon the mind; a sensation. With over 50 raw images on display, KSOLE shares his personal feelings from a country known as home. Kenneth “KSOLE” Soleta resides in Los Angeles, CA. He has photographed for Levi’s, UNIQLO, Hewlett Packard, and 5th Element Magazine. IMPRESSIONS will be his first exhibit. Since September2014, illest Los Angeles has operated as both a retail space and art gallery. Under the curation of Tricia Jamanila, illest completed exhibits for Ja Tecson (“Snapshots”) and Antonio Brasko (“Brandalism”).